The Community Food Growers Network (CFGN) has been meeting community food projects around London with the aim to build an interactive online map that can be used as a tool for people to find food growing projects, and that food growers can find other food growers. To cover all the brilliant food growing projects in London would be quite a feat, and so we have started with over 35 gardens and plan to add to these in the coming year. There is still time to add projects to the map and if you would like to be added or know a project that should please email cfgn@riseup.net. 2-3pm: Free posters of the map will be available, and the online map will be launched with a projection for people to try out the tool for the first time. 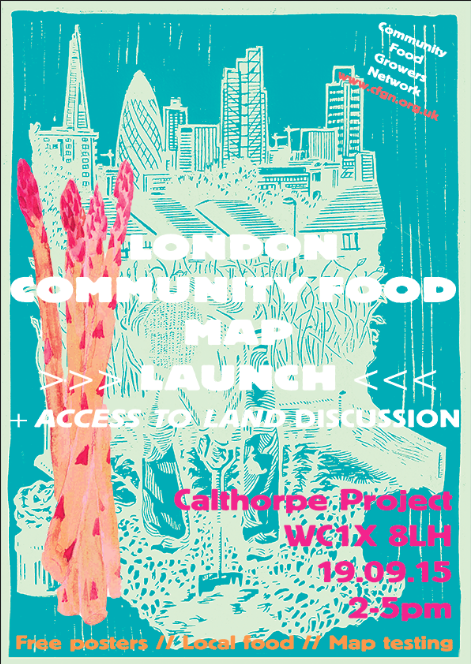 Locally-produced food will be available to eat and an opportunity to meet community food growers from across London. If you have food to share at the event then this would be much appreciated, and perhaps contact cfgn@riseup.net to let us know what you can bring. 3.30-5pm: CFGN is working with the Centre for Agroecology, Water and Resilience at Coventry University to write a chapter to an edited e-book, entitled, Action Research for Food Systems Transformation. The chapter, entitled, Reclaiming a Plot, Re-imagining a City, will explore and reflect the experiences of gaining access to land in London for community food production, and what future steps would be beneficial to build stronger local food systems. The first draft of the chapter will be presented on the day leading to feedback and discussion that will be fed into the final writing to make the chapter as participative as possible.